Warmer air temperatures high above the Antarctic led to the second smallest seasonal ozone hole in 20 years, according to NOAA and NASA satellite measurements. The ozone hole reached its maximum size Sept. 22, covering 8.2 million square miles (21.2 million square kilometers), or the area of the United States, Canada and Mexico combined. The average size of the 2012 ozone hole was 6.9 million square miles (17.9 million square kilometers). "The ozone hole mainly is caused by chlorine from human-produced chemicals, and these chlorine levels are still sizable in the Antarctic stratosphere," said NASA atmospheric scientist Paul Newman of NASA's Goddard Space Flight Center in Greenbelt, Md. "Natural fluctuations in weather patterns resulted in warmer stratospheric temperatures this year. These temperatures led to a smaller ozone hole." The 2012 ozone hole has passed its largest, and was smaller than the decadal average. The winter polar vortex over Antarctica is now rapidly dissipating. Ozone values outside the vortex are declining from their peak values, with the maximum now just above 400 DU, down from a peak of 470 DU. Inside the vortex ozone depletion rapidly took place as the sun returned, but has passed its worst, with lowest values over Dronning Maud Land now at around 210 DU, up from a minimum of around 125 DU. NOAA measurements indicate a much smaller ozone hole than normal during August and early September, but it then grew rapidly to around 19 million square kilometres in the second half of September. This is smaller than the mean for the last decade, but comparable to that of 2010. The hole shrank quickly during October, and now covers 2 million square kilometres. This is close to the smallest it has been at this time of year over the last decade. In general the zonal minimum ozone layer temperature (between 70 and 30 hPa) was a little cooler than the normal during the early winter, however a warming event took place in late August. The temperature throughout the ozone layer is now quickly rising, and is above the Polar Stratospheric Cloud (PSC) formation temperature, and is warmer than the normal for the time of year. The August warming event meant that the amount of PSC available for ozone depletion was smaller than usual, leading to the smaller, shallower ozone hole. whilst a spun-off fragment passed over the area between September 4 and 7. The winter polar vortex remains established over part of Antarctica. Ozone values outside the vortex are declining from their peak values, with the maximum now around 430 DU, down from a peak of 470 DU. Inside the vortex ozone depletion rapidly took place as the sun returned, but has passed its worst, with lowest values over the Weddell Sea now at around 180 DU, up from a minimum of around 125 DU. NOAA measurements indicate a much smaller ozone hole than normal during August and early September, but it then grew rapidly to around 19 million square kilometres in the second half of September. This is smaller than the mean for the last decade, but comparable to that of 2010. The hole shrank quickly in the first half of October, but has covered 8 million square kilometres for the last ten days. In general the zonal minimum ozone layer temperature (between 70 and 30 hPa) was a little cooler than the normal during the early winter, however a warming event took place in late August. The temperature throughout the ozone layer is now rising, and is above the Polar Stratospheric Cloud (PSC) formation temperature, and is warmer than the normal for the time of year. The August warming event meant that the amount of PSC available for ozone depletion was smaller than usual, leading to the smaller, shallower ozone hole. The fringes of the ozone hole passed over the tip of South America, the Falkland Islands and South Georgia over August 24 to 28 and September 21-24, whilst a spun-off fragment passed over the area between September 4 and 7. The winter polar vortex remains established over Antarctica, with ozone values continuing to build around the continent (maximum around 460 DU). Inside the vortex ozone depletion rapidly took place as the sun returned, but may have passed its worst, with l owest values over West Antarctica at around 130 DU. NOAA measurements indicate a much smaller ozone hole than normal during August and early September, but it then grew rapidly to around 19 million square kilometres in the second half of September. This is smaller than the mean for the last decade, but comparable to that of 2010. It now covers 14 million square kilometres. In general the zonal minimum ozone layer temperature (between 70 and 30 hPa) was a little cooler than the normal during the winter. It is now rising, but remains below the Polar Stratospheric Cloud (PSC) formation temperature between 100 and 50 hPa. By contrast the zonal mean temperature of the ozone layer is already above the PSC formation temperature. This means that the amount of PSC available for ozone depletion is smaller than usual. The fringes of the ozone hole passed over the tip of South America, the Falkland Islands and South Georgia over August 24 to 28 and September 21-24, whilst a spun-off fragment passed over the area between September 4 and 7. The 2012 ozone hole has formed. The winter polar vortex remains established over Antarctica, with ozone values continuing to build around the continent (maximum around 450 DU). Inside the vortex ozone depletion is rapidly taking place, with lowest values over the Ronne Ice Shelf at around 120 DU. NOAA measurements indicate a much smaller ozone hole than normal during August and early September, but it then grew rapidly and now covers 19 million square kilometres. This is still smaller than the mean for the last decade, but comparable to those of 2010 and 2002. In general the zonal minimum ozone layer temperature (between 70 and 30 hPa) has been a little cooler than the normal, and is well below the PSC formation temperature. Although this temperature was rising, near the equinox it suddenly dropped back to the winter minimum. By contrast the zonal mean temperature of the ozone layer is already rising and is above the PSC formation temperature. This means that the amount of PSC available for ozone depletion is smaller than usual. 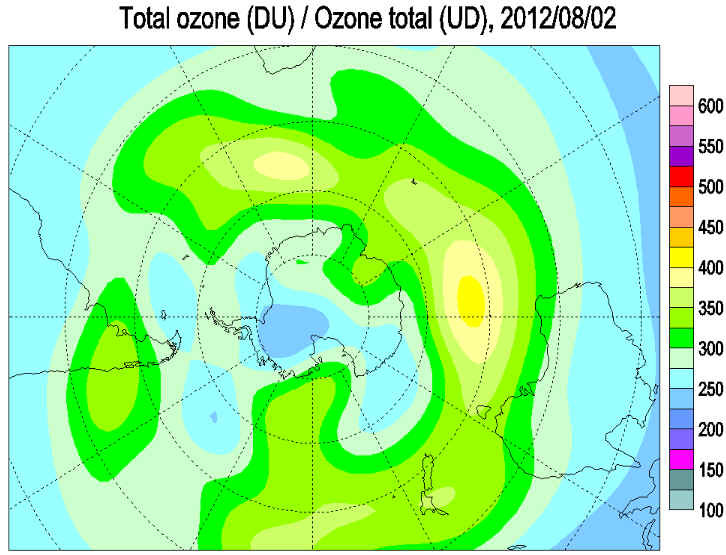 Ozone values are predicted to fall in the sunlit outer regions of the ozone hole over the coming week. The fringes of the ozone hole passed over the tip of South America, the Falkland Islands and South Georgia over August 24 to 28 and September 21-22, whilst a spun-off fragment passed over the area between September 4 and 7. The winter polar vortex is established over Antarctica, with ozone values building around the continent (maximum around 430 DU). Inside the vortex ozone depletion is rapidly taking place, with lowest values over the base of the Antarctic Peninsula at around 170 DU. 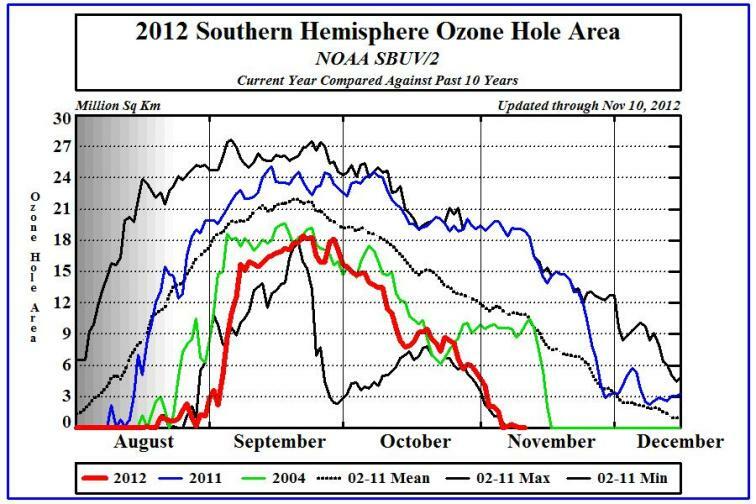 The 2012 ozone hole is now well established. 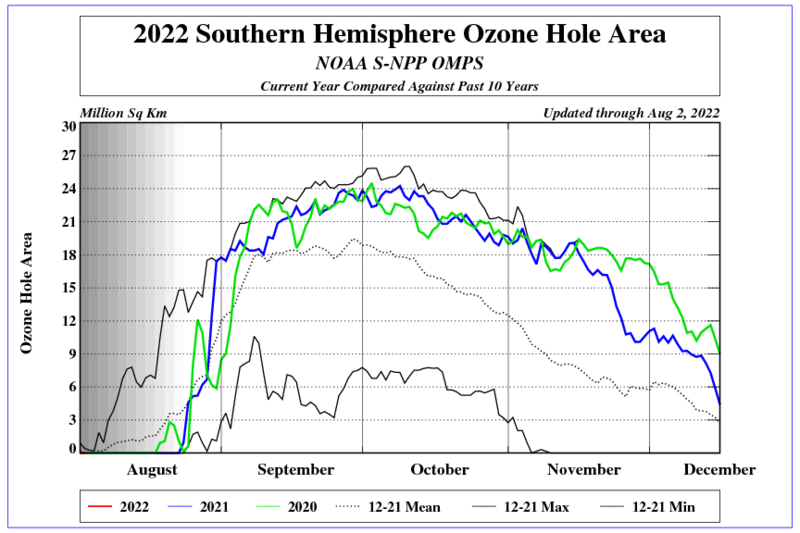 NOAA measurements indicate a m uch smaller ozone hole than normal during August and early September, but it has begun to grow rapidly and now covers 17 million square kilometres. This is still smaller than the mean for the last decade, but comparable to those of 2010 and 2002. In general the minimum ozone layer temperature (between 70 and 30 hPa) has been a little cooler than the normal, and is well below the PSC formation temperature. By contrast the zonal mean temperature of the ozone layer is already rising and is above the PSC formation temperature. This means that the amount of PSC available for ozone depletion is smaller than usual. Ozone values are predicted to fall in the sunlit outer regions of the ozone hole over the coming week. The fringes of the ozone hole passed over the tip of South America, the Falkland Islands and South Georgia over August 24 to 28, and a spun-off fragment passed over the area between September 4 and 7. 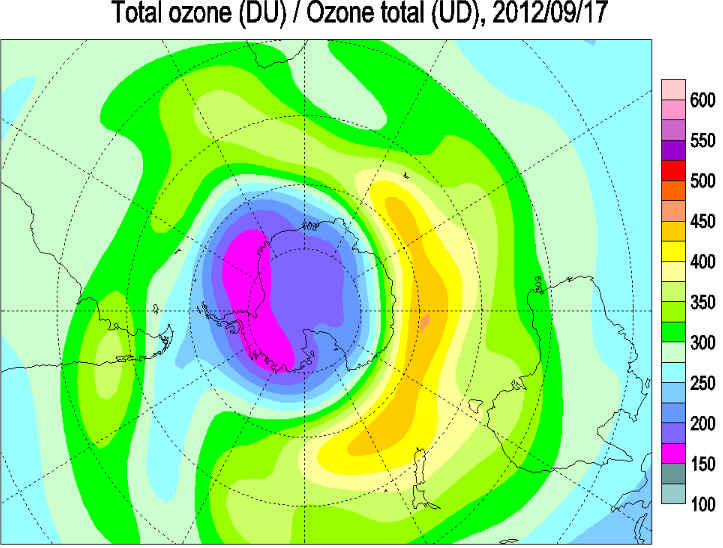 Situation at 2012 September 14 British Anarctic Survey The winter polar vortex is established over Antarctica, with ozone values building around the continent (maximum around 430 DU). Inside the vortex ozone depletion is rapidly taking place, with lowest values over the base of the Antarctic Peninsula at around 170 DU. 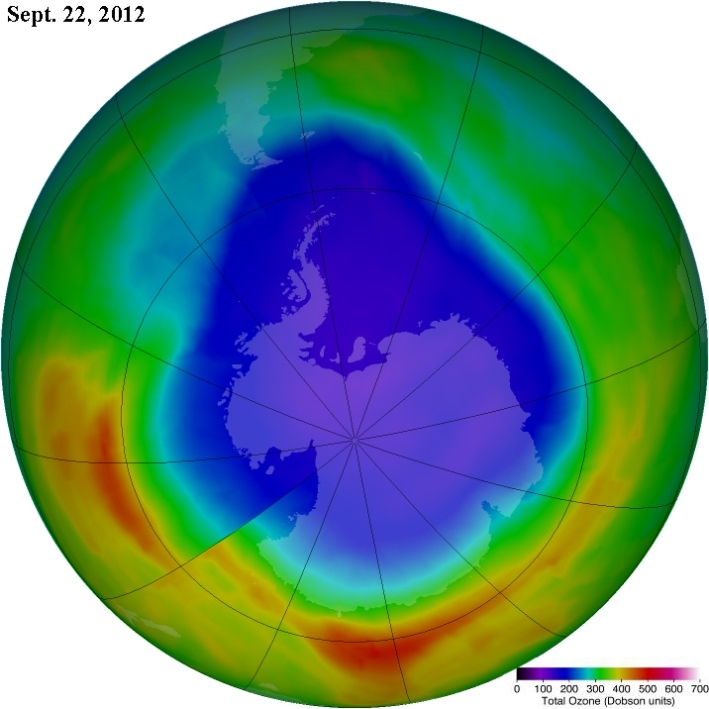 The 2012 ozone hole is now well established. NOAA measurements indicate a mu ch smaller ozone hole than normal during August and early September, but it has begun to grow rapidly and now covers 16 million square kilometres. This is still smaller than the mean for the last decade, but comparable to those of 2010 and 2002. In general the minimum ozone layer temperature (between 70 and 30 hPa) has been a little cooler than the normal, and is well below the PSC formation temperature. By contrast the zonal mean temperature of the ozone layer is already rising and is above the PSC formation temperature. This means that the amount of PSC available for ozone depletion is smaller than usual. 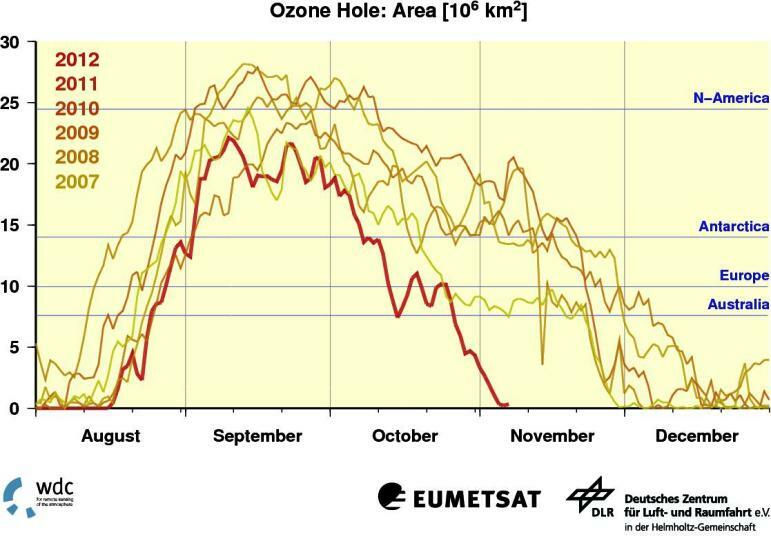 Ozone values are predicted to fall in the sunlit outer regions of the ozone hole over the coming week. The fringes of the ozone hole passed over the tip of South America, the Falkland Islands and South Georgia over August 24 to 28. The winter polar vortex is established over Antarctica, with ozone values building around the continent (maximum around 430 DU). 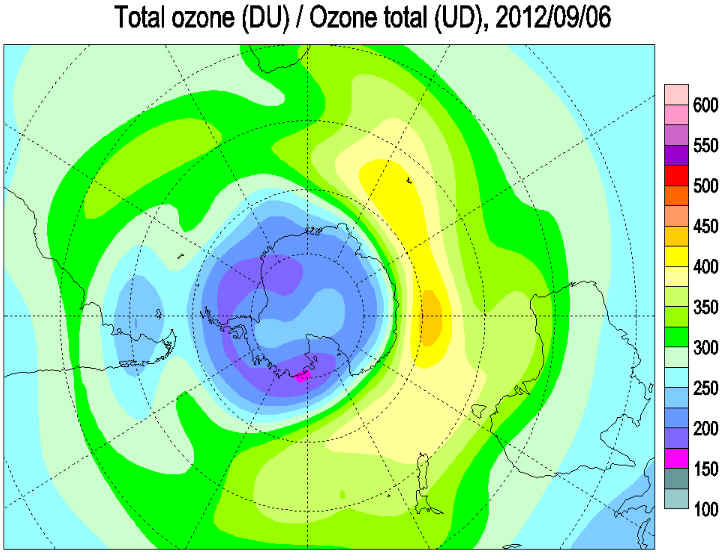 Inside the vortex ozone depletion is rapidly taking place, with lowest values over Coates Land at around 190 DU, and the 2012 ozone hole is now well established. In general the ozone layer temperature (between 70 a nd 30 hPa) has been a little cooler than the normal, and is well below the PSC formation temperature. The ozone layer is now at its coldest. Higher in the atmosphere at 10 hPa warming is already underway. 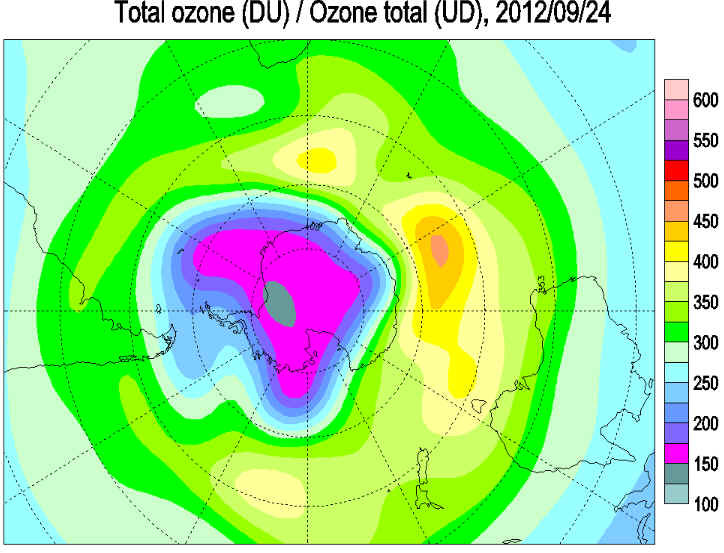 Ozone values are predicted to fall in the sunlit outer regions of the ozone hole over the coming week. The fringes of the ozone hole passed over the tip of South America, the Falkland Islands and South Georgia over August 24 to 28. Situation at 2012 August 13 British Antarctic Survey The winter polar vortex is established over Antarctica, with ozone values building around the continent (maximum around 390 DU). 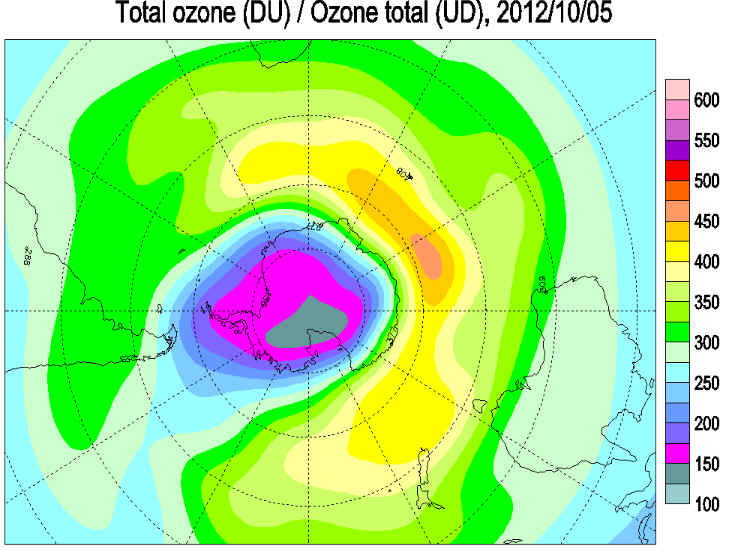 Inside the vortex ozone depletion is beginning to take place, with lowest values around 240 DU. In general the ozone layer temperature has been a little cooler than the normal, and is well below the PSC formation temperature. The winter polar vortex is established over Antarctica, with ozone values building around the continent (maximum around 390 DU). Inside the vortex ozone depletion is beginning to take place, with lowest values, around 240 DU, over the Coats Land area. In general the ozone layer temperature has been a little cooler than the normal, and is well below the PSC formation temperature, though it has returned to near normal over the last few weeks. Situation at 2012 July 23 The winter polar vortex is established over Antarctica, with ozone values building around the continent (maximum around 390 DU). Inside the vortex ozone depletion is beginning to take place, with lowest values, around 240 DU, over the Weddell Sea area. In general the ozone layer temperature has been a little cooler than the normal, and is well below the PSC formation temperature.